Recent activities around changing the status of marijuana from one of the most dangerous and addictive drugs without medical quality to a less dangerous one, such as cocaine (we’ll comment on this one later in the article) has gained a momentum and we hope it will all be over soon, because we’re ashamed to admit that our nation’s law makers have been waiting for so long to say that heroin and marijuana do not belong in a same basket. This new bi-partisan bill is called the Compassionate Access, Research Expansion and Respect States Act (CARERS), and it aims to change the federal status of marijuana from Schedule I from Schedule II substance, which would open the door to an array of opportunities related to marijuana. Most importantly, it would allow doctors to discuss it as a treatment option with their patients and it would allow for much needed medical research of the drug. Categorization of the drugs in the U.S.
As mentioned earlier, the U.S. has come up with a categorization system for drugs and related drug ingredients. There are currently five categories under the Controlled Substances Act (CSA). The term “controlled substance” encompasses drugs (or other substances) included in schedule I, II, III, IV, or V and does not include distilled spirits, wine, malt beverages, or tobacco. 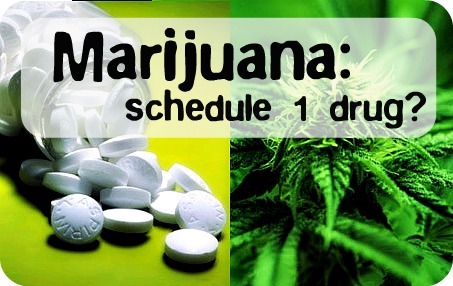 Schedule I is reserved for bad boys and girls in the world of drugs – it is what the Drug Enforcement Administration (DEA) considers to be the most dangerous drugs without accepted medical value. Marijuana has been classified as Schedule I for decades, alongside substances such as heroin, LSD and MDMA. Not even cocaine is in this category, which means that marijuana is currently considered to be more dangerous than cocaine and cocaine is considered to have more medical qualities than marijuana. Does that sound silly or what? Cocaine has found its place in Schedule II category among the drugs such as opium, methylphenidate (Ritalin) and methadone (used for treatment of heroine addiction). All these drugs are considered to have “currently accepted medical use”, yet somehow, someone decided that is not a place for marijuana. We would love to meet this person (or a team!). Recent ballot measures in states such as Colorado and Washington D.C. have made allowances for recreational and medical use of marijuana and have decriminalized possession of small amounts of marijuana (not in all of the states). The confusing part here is that these measures operate only on state level, and have no effect on Federal law, which basically means that all those medical marijuana dispensaries could be shut down tomorrow if Federal law decided so. Despite these revolutionary measures, despite hundreds of millions of dollars in economic activity and nearly half of the country living in some sort of medical marijuana limbo, and despite numerous scientific studies showing its medicinal benefits, marijuana remains in Schedule I category for decades and hopefully that is about to change soon.